^ 商業周刊-國際-全球-金融海嘯：雷曼兄弟破產啟示錄. 商業周刊. 2008-09-22 [2008-09-22]. ^ HM Treasury, Bank of England and Financial Services Authority. 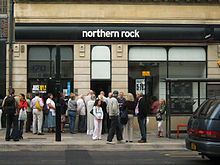 News Release: Liquidity Support Facility for Northern Rock plc. September 14, 2007. ^ "Treasury Announces Guaranty Program for Money Market Funds" 互联网档案馆的存檔，存档日期2009-05-02.（September 19, 2008）Press Release. United States Department of the Treasury. ^ Australian short selling ban goes further than other bourses. NBR. 2008-09-22 [2008-09-22]. （原始内容存档于2011-09-27）. ^ Sorkin, Andrew Ross. Citigroup to Buy Wachovia Banking Operations. The New York Times blog Dealbook. 2008-09-30 [2008-09-29]. ^ Grynbaum, Michael M. For Stocks, Worst Single-Day Drop in Two Decades. The New York Times. 2008-09-29 [2008-09-29]. ^ Twin, Alexandra. Stocks crushed. CNN Money. 2008-09-29 [2008-09-29]. ^ Government statement (of the Government of Ireland). The Irish Times. 2008-10-01 [2008-10-01]. ^ Herszenhorn, David M. House Approves Bailout on Second Try. The New York Times. 2008-10-03 [2008-10-03]. ^ Schwartz, Neson D. Netherlands Takes Over Some Fortis Operations. The New York Times. 2008-10-03 [2008-10-03]. ^ Teather, David. Reykjavik battles to save economy. The Guardian. 2008-10-07 [2008-10-06]. ^ Deutsche Welle。Berlin has Given a Blanket Guarantee for all Private Bank Savings 互联网档案馆的存檔，存档日期2009-01-14..（English）Retrieved 2008-10-06.（video, English）Merkel: "we also pledge that those who have conducted business irresponsibly will be held to account. The government will ensure that that happens." ^ Grynbaum, Micheal M. Chaotic Day Ends With Stocks Off 3.8%. The New York Times. 2008-10-06 [2008-10-06]. ^ Hosking, Patrick. Banking crisis: the world takes fright. The Times. 2008-10-07 [2008-10-07]. ^ The Financial Supervisory Authority - Iceland, News: Based on New Legislation, the Icelandic Financial Supervisory Authority (IFSA) Proceeds to take Control of Landsbanki to ensure Continued Commercial Bank Operations in Iceland（07.10.2008） 互联网档案馆的存檔，存档日期2008-10-10. ^ Central Bank of Iceland, The Foreign Exchange Reserves of the Central Bank of Iceland bolstered（07.10.2008; No. 31/2008） 互联网档案馆的存檔，存档日期2011-04-29. ^ Central Bank of Iceland, Foreign exchange reserves（07.10.2008; No. 33/2008） 互联网档案馆的存檔，存档日期2011-04-29. ^ 78.0 78.1 lesova, Polya. Iceland takes dramatic steps to stabilize economy. Russia Today (Moscow). 2008-10-07 [2008-10-07]. ^ 79.0 79.1 Financial crisis at-a-glance: 7 Oct. 2008-10-07 [2008-10-07]. ^ HM Treasury. Treasury's official announcement on the banks. The Guardian. 2008-10-08 [2008-10-08]. ^ Wearden, Graeme. Government to spend £50bn to part-nationalise UK's banks. The Guardian. 2008-10-08 [2008-10-08]. ^ Federal Reserve and other central banks announce reductions in policy interest rates. [2008-10-08]. ^ Central banks announce reductions in policy interest rates. 2008-10-08 [2008-10-08]. ^ ECB homepage. 2008-10-08 [2008-10-08]. ^ BBC News - Central banks cut interest rates. [2008-10-08]. ^ The Financial Supervisory Authority - Iceland, News: Based on New Legislation, the Icelandic Financial Supervisory Authority (FME) Proceeds to take Control of Kaupþing to ensure Continued Commercial Bank Operations in Iceland（09.10.2008） 互联网档案馆的存檔，存档日期2008-10-14. ^ Kaupthing Bank, Press release: Kaupthing Bank turns to the Icelandic FSA（2008.10.09） 互联网档案馆的存檔，存档日期2008-10-12. ^ "Dow Falls 387 Points on New Loan Fears"
^ Chart of the Dow Jones Industrial Average 互联网档案馆的存檔，存档日期2008-09-05. ^ Citi to acquire Wachovia's banking operations. MarketWatch. 2008-09-29 [2008-09-29]. Timeline: Global credit crunch Published in BBC News on 6 October 2008. Five Days That Transformed Wall Street. The Washington Post. Ben S. Bernanke. Text of the testimony prepared for delivery before the Senate Committee on Banking, Housing, and Urban Affairs. The New York Times. September 23, 2008. Henry M. Paulson, Jr. Text of the testimony prepared for delivery before the Senate Committee on Banking, Housing, and Urban Affairs. The New York Times. September 23, 2008.